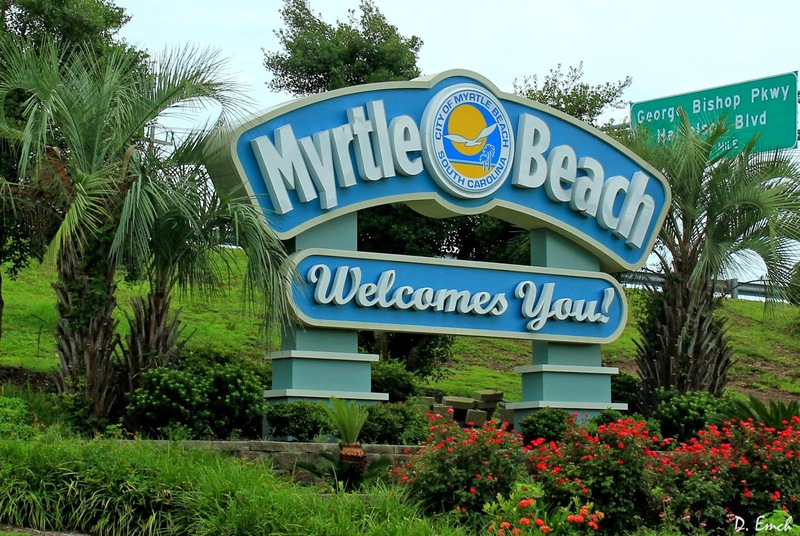 Welcome to Myrtle Beach SC, whose greater metropolitan area is home to roughly 465,000 people. It is a resort town, and as such houses numerous tourist attractions. Over the next couple of days we will explore a few of the better ones. 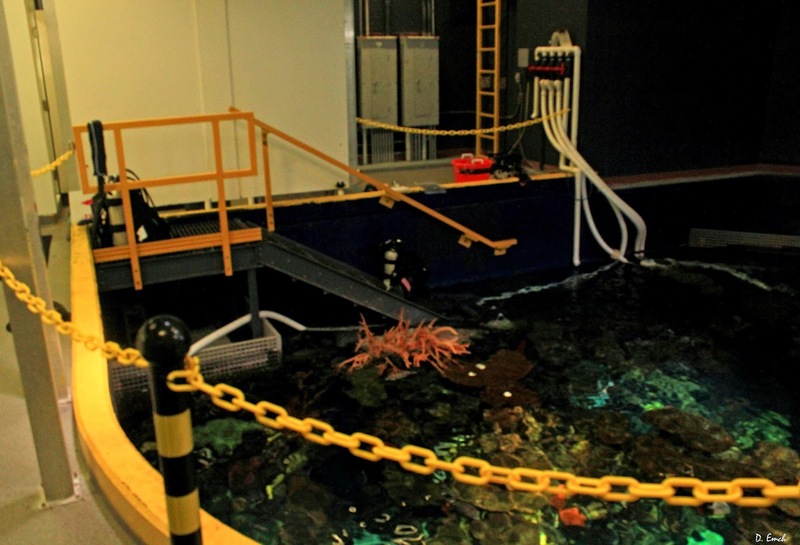 First up are the Ripley's facilities - 4 of which are on the ocean-side boardwalk and the other, the aquarium that is situated about a mile inland. Ripley (1890 - 1949) was a cartoonist who featured unusual items and odd facts from around the globe in his writings. He was immensely popular at his peak. 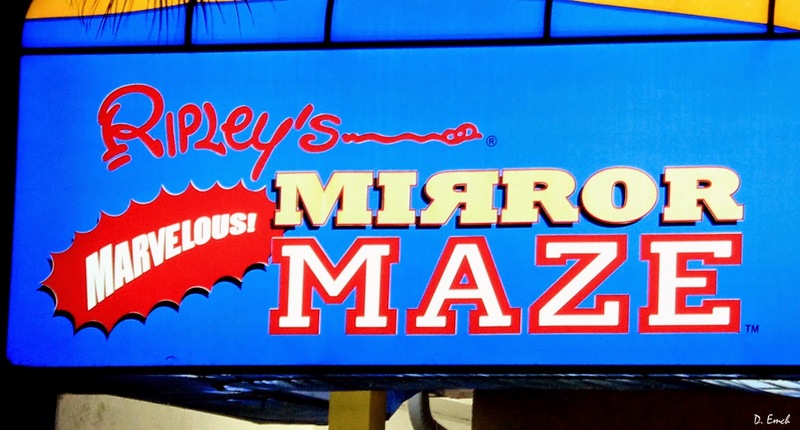 The Ripley's of today is a large corporation with attractions in Thailand, Mexico, Malaysia and at various locations around the USA. They are currently owned by the Jim Pattison Group out of Vancouver, and employ roughly 200 people in the Myrtle Beach locations. 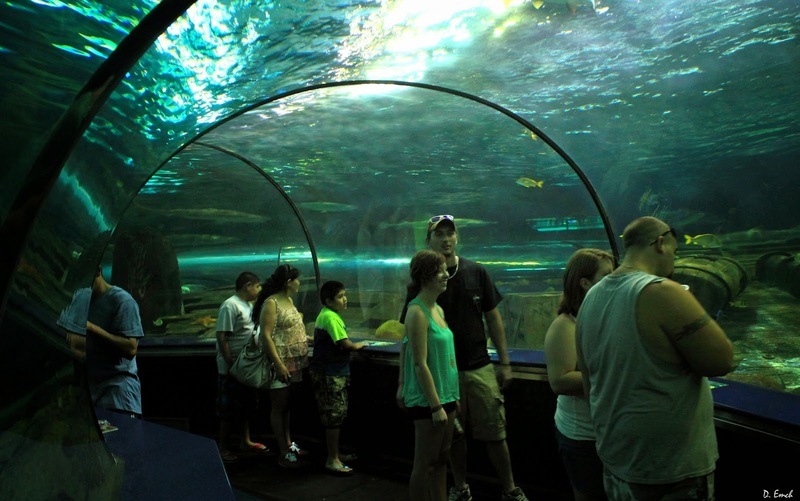 Of the five attractions, the aquarium is both the most visited and the most complex operation. 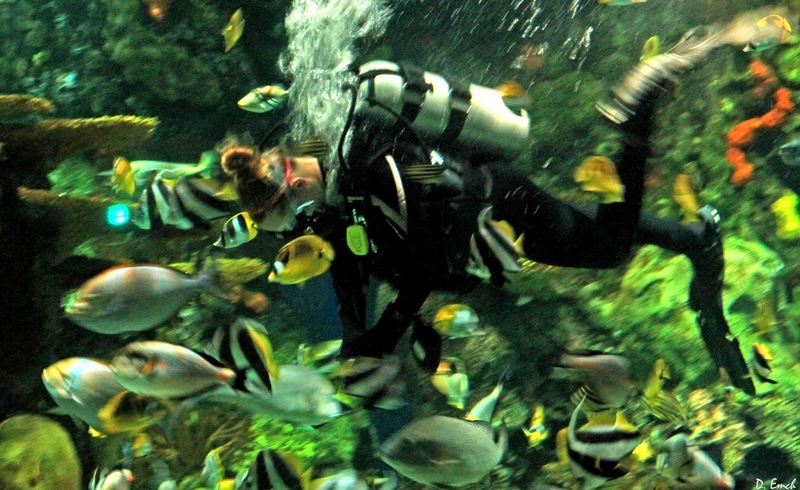 The five total about two million visitors a year, half of which the aquarium accounts for. It sits alongside a small lake in a complex of other attractions called "Broadway at the Beach." 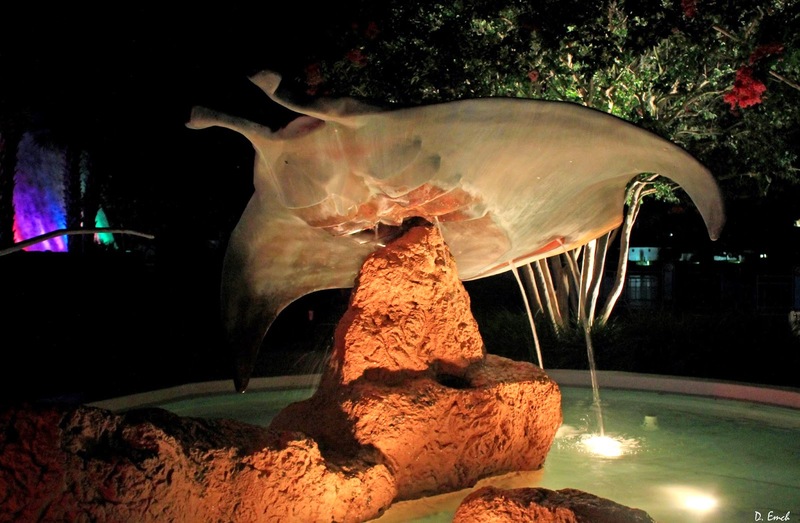 3 large sculptures of manta rays grace a fountain outside the front door. When you first arrive you start to get a feel for the complexity of the place. 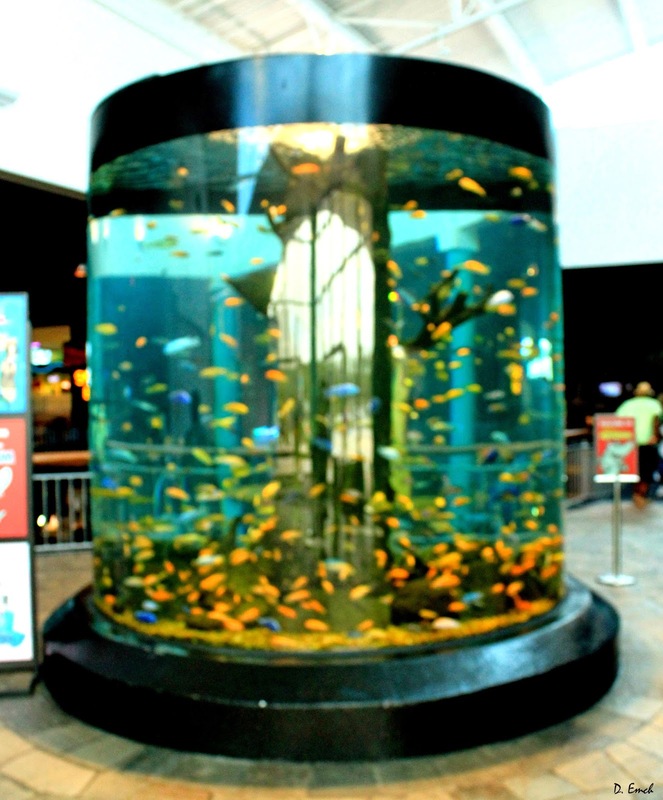 This beautiful cylindrical aquarium is a freshwater tank that mimics the chemistry of one particular lake in Africa. All of the species of fish in the tank are also from that particular lake. Marketing director (not pictured) Jessica Mula was a big help, as was Dominic Calvano, pictured below. Dominic is pictured with a "Mr. Potato Head" which is one of many toys used to keep a resident octopus mentally challenged. Octopus are extremely intelligent, and if they are bored they are known to start eating their own limbs. So such games and puzzles are necessary to keep them going. For those of you who follow the neurology articles I have written, the octopus is an enigma. Two thirds of the creatures nervous system is away from the central "brain," creating a highly complex thought processing system. 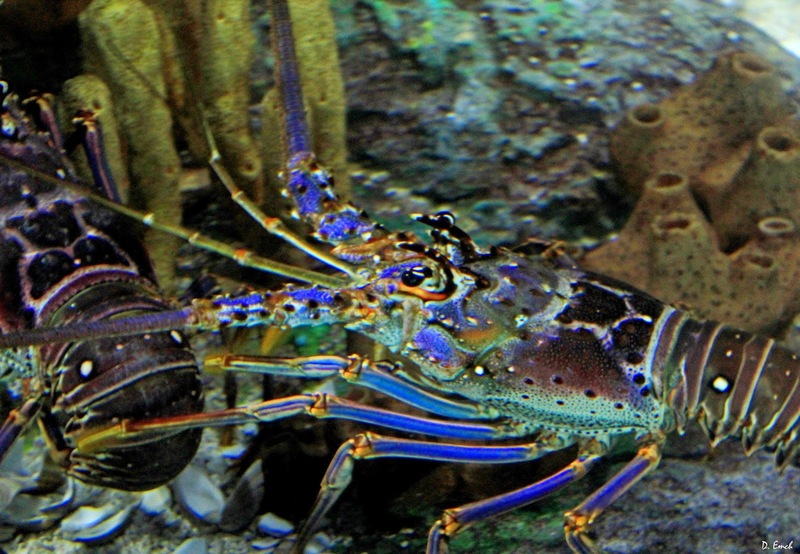 They are known to solve complex puzzles in a matter of seconds - they really are amazing creatures. 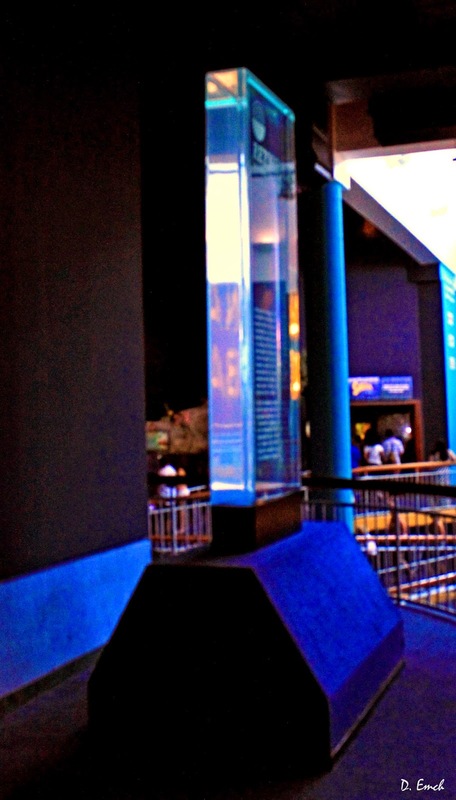 All of the various tanks and waterfalls represent more than a million gallons of water that has to be filtered and kept at the proper chemical makeup that the species in that particular tank require. 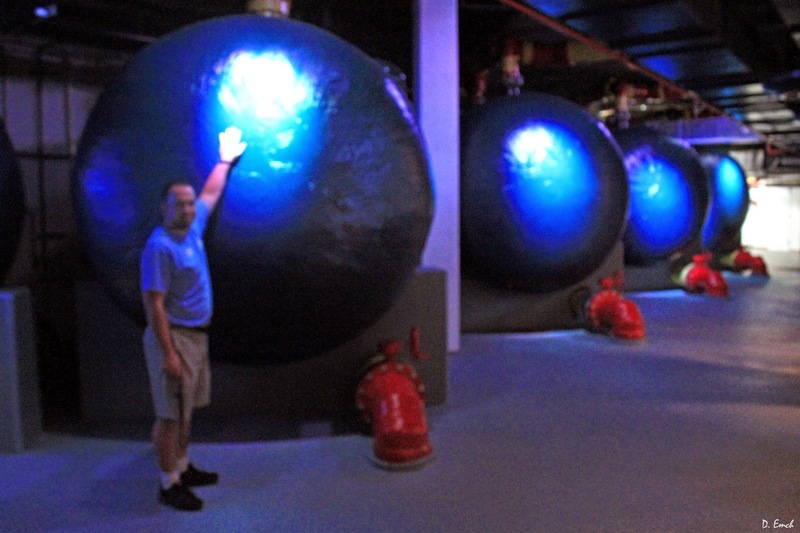 Here Dominic stands in front a few of the many filtration tanks that the aquarium uses. For the salt water tanks - they make their own salt water to avoid the chance of parasites and disease infecting the populations. To make these one million gallons of water like ocean water took 350,000 pounds of salt - a bunch !! 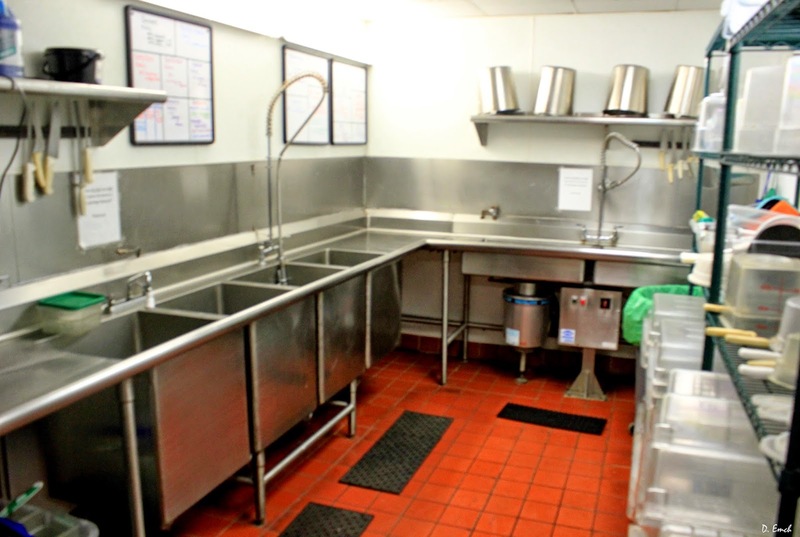 This is the food prep area, and there are large freezers and coolers to accommodate all of the food it takes to feed the large variety of specimens here. There are also water quality and biology labs. Besides all the tanks, the outside walls of the building are themselves waterfalls. 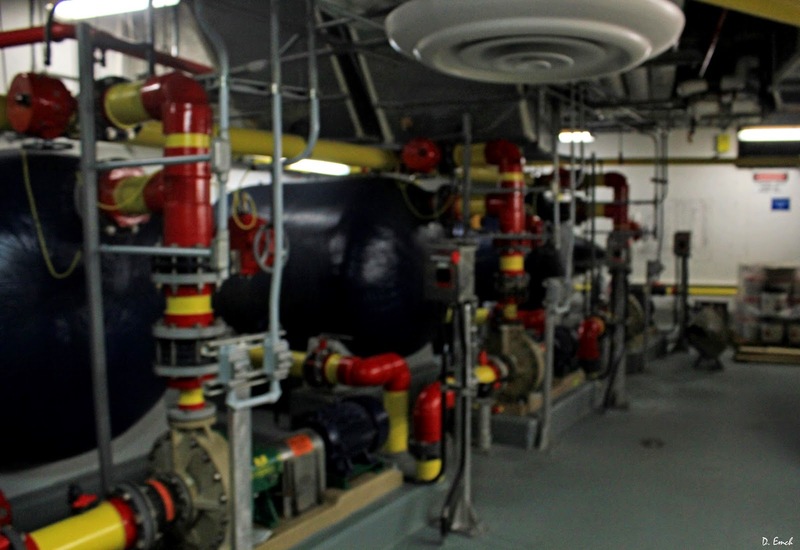 Numerous large pumps run the operation. In case of a power outage the aquarium is the second client to get electricity in this city - right behind the local hospitals. The do have a large emergency generator as well. 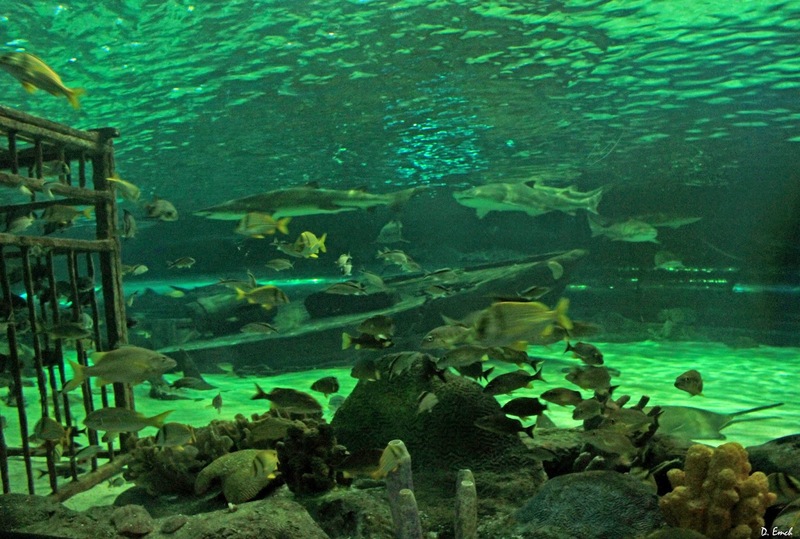 There are numerous large tanks that you can walk by, around, under and through. Pictured above is the largest tank which holds 750,000 gallons of water. Numerous shark species inhabit it along with a large sea turtle, saw-fish and a few other species. There is a resident nurse shark that has figured out a trick to this whole deal. Usually a shark has to keep moving to "breathe" - if it stays still it suffocates. However, this particular nurse shark has figured out she can just sit still in front of the water inlet and let the water pumps do the work for her. Here is what the top of a tank looks like - and the view below when a scuba diver is inspecting the tank. There are some surprising species here - including lobster and "poison dart frogs" from the amazon. 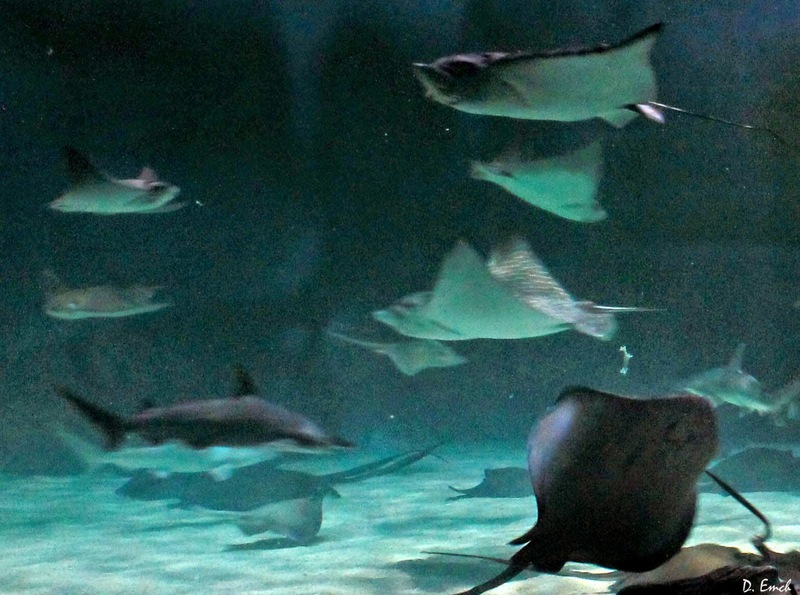 If you want to pay an extra $50, you can snorkel in the manta-ray tank. 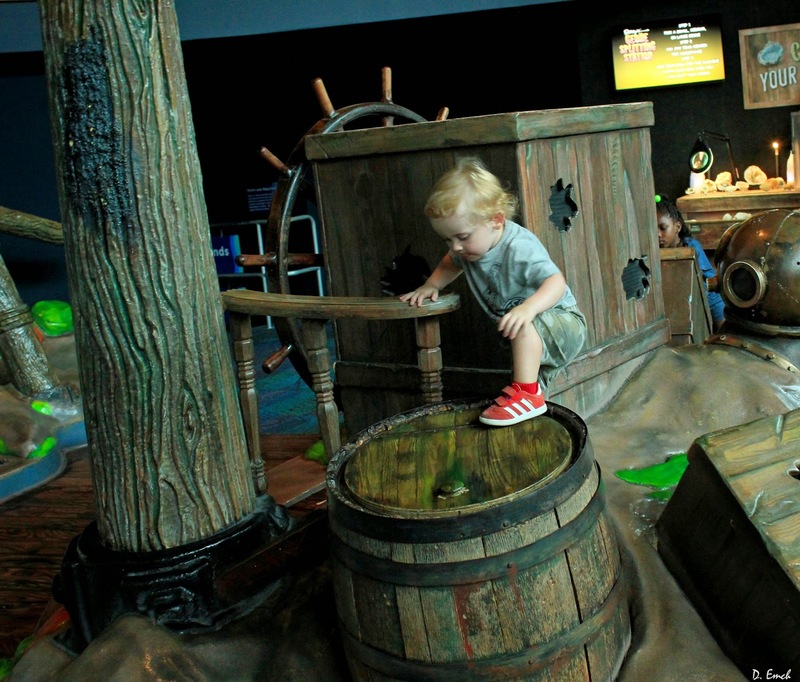 There are numerous play areas for children. I don't have enough space here to do justice to the number of species and tanks - but it is a good place to take your time and absorb all you are seeing. It is amazing what we as mankind can do to re-create environments from all over the world in order to be able to view living creatures that only a few of us would ever see. 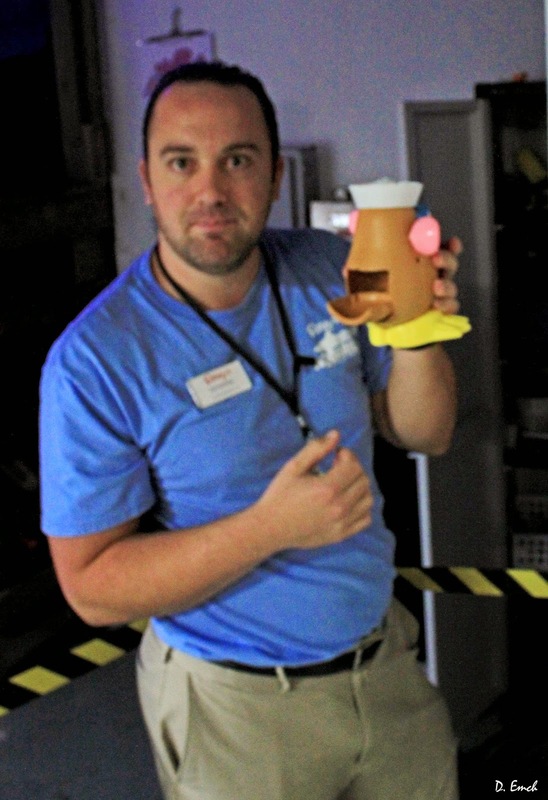 Meet Lee Douglas, the general manager of the other 4 Ripley's attractions in Myrtle Beach. Lee worked with Ripley s in Gatlinburg Tennessee before coming to Myrtle Beach in June. He shared a lot of facts about the company - one of the most interesting is that Ripley's now owns the Guinness Book of World Records brand, which adds a whole new but complimentary dimension to the Ripley's brand. First up we will take a glance through the museum - a collection of over 500 "oddities." I only have space for a few, but suffice it to say that many of the far-flung cultures that Ripley visited had a tradition of utilizing the bones of their dead relatives to make functional household items. 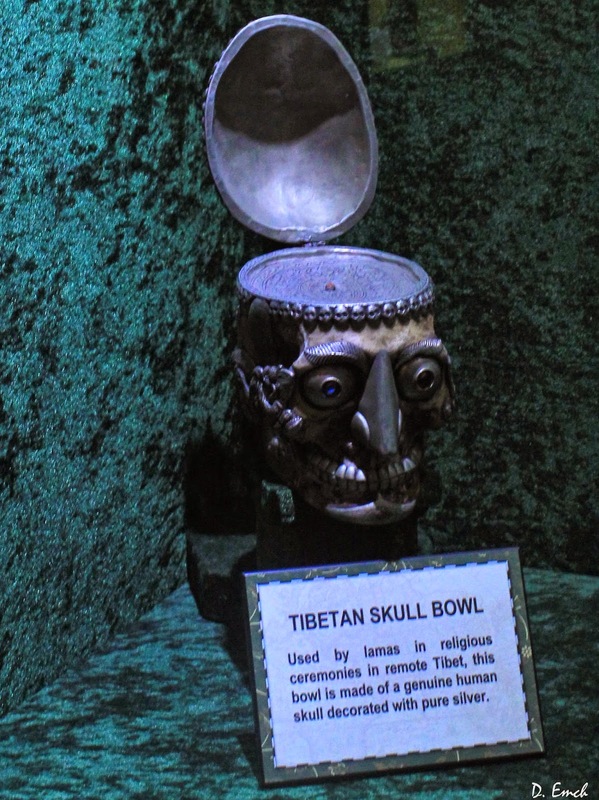 Below is a skull turned into a silver lined bowl. 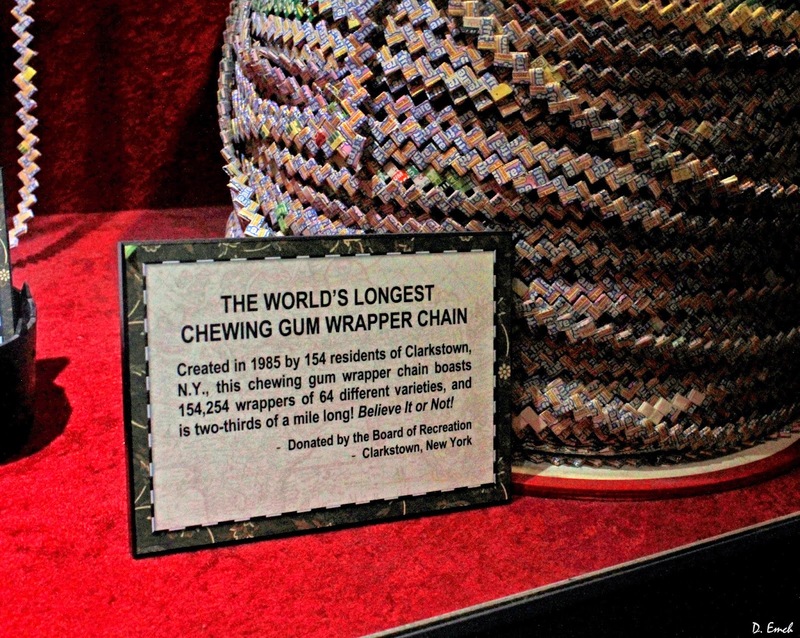 Remember chewing gum chains? Here is the world record holder. 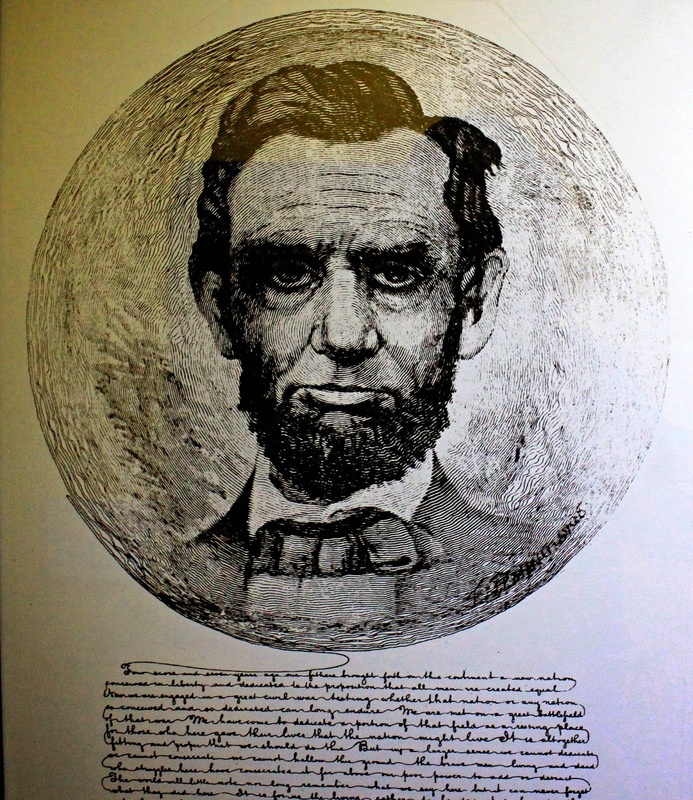 This Gettysburg Address and picture of Abraham Lincoln was drawn using a single line - the pen never left the paper !! 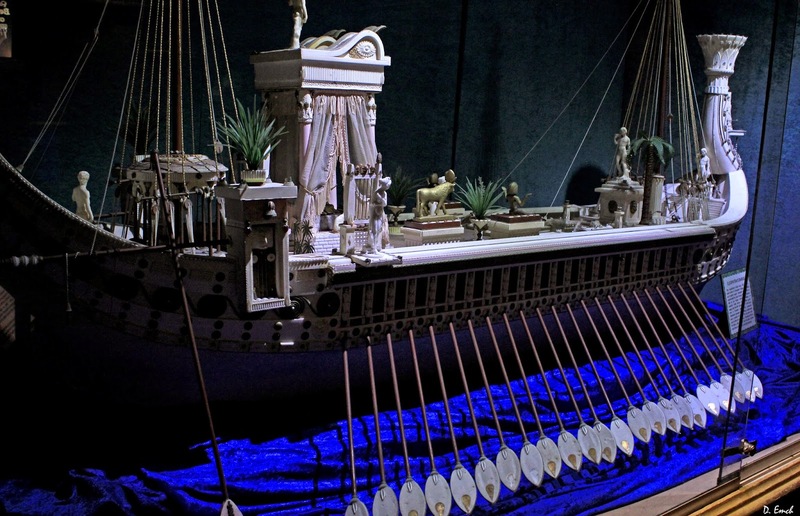 This Egyptian barge is made entirely of confectionery sugar. 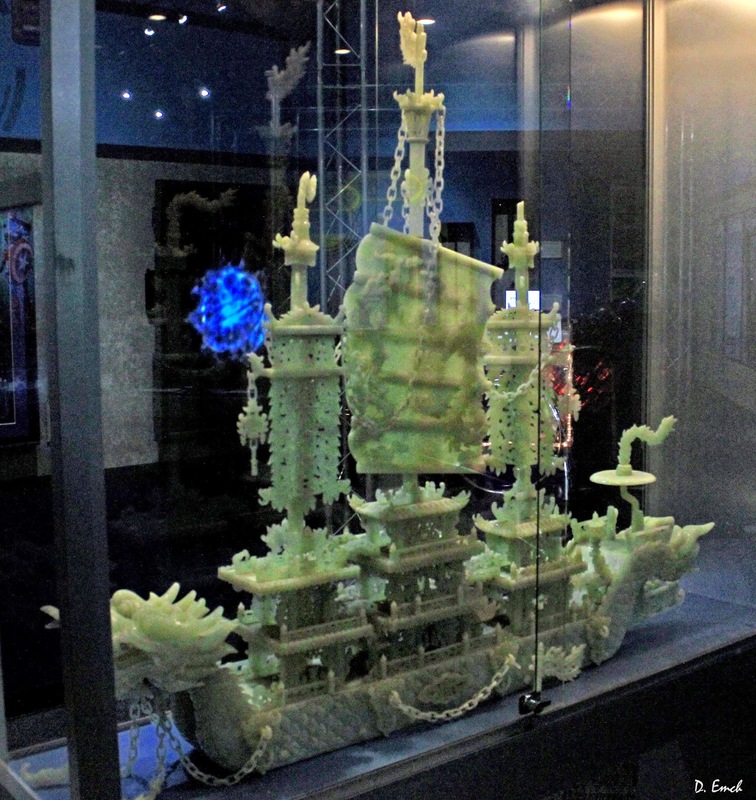 And this Asian boat is made entirely from Jade. 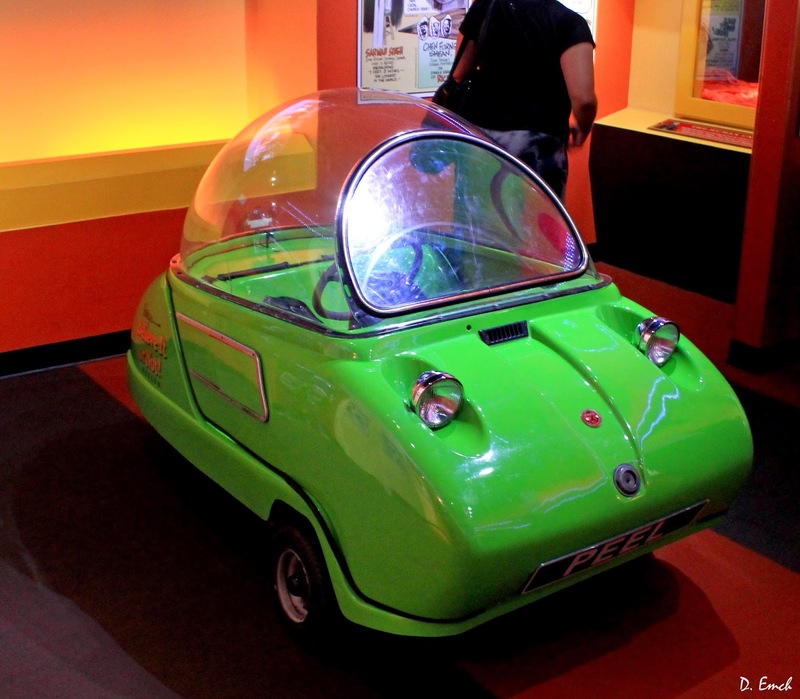 The World's smallest car . . .
. . manufactured on Isle of Man from 1962 to 1965. Only a few hundred pounds, it still reached speeds around 40 mph. 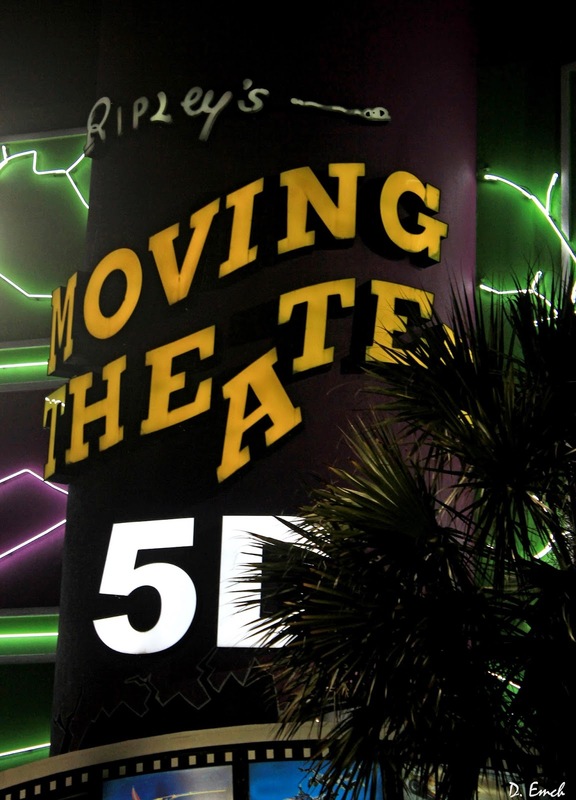 Next up is the moving theater. 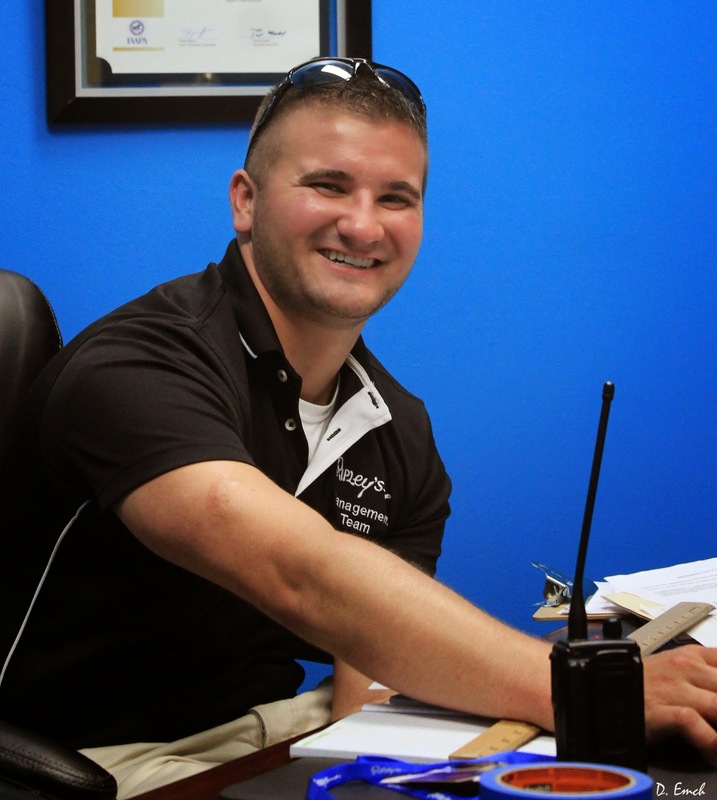 Meet Holden Hewett, who oversees the equipment at these 4 Ripley sites. 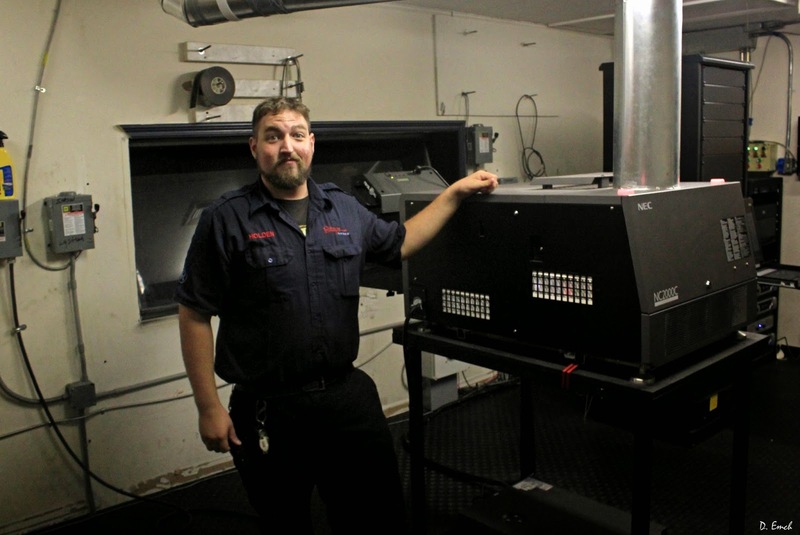 He is standing by the 3D movie projector, very similar to the projector we saw at Lucas Theatre in Savannah GA. Holden has a degree in electronics from nearby Georgetown College. The theater consists of three long rows of seats that face a screen. 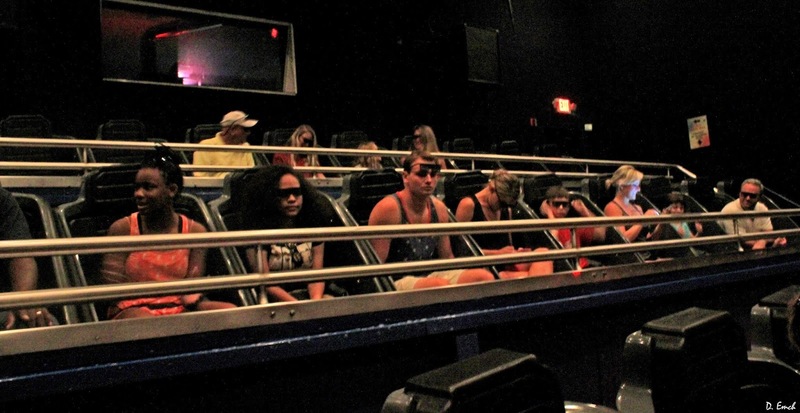 3D glasses are given so that the visual effect is very real. Then the seats themselves move. 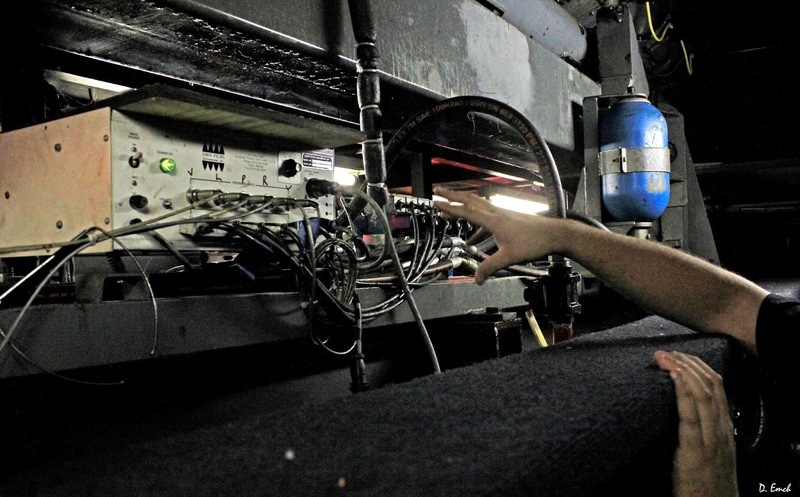 Beneath the theater is a large complex of hydraulics and electronics. Bottom line is that you are moved forward and back, up and down and left and right. Not only does Holden maintain all this equipment, he actually programs it all when they get new videos. And the entire operation is run from an i-pad - believe it or not !! A dishwasher handles the glasses between shows. I rode the ride, and it really was a bit disconcerting to me. Our senses are not used to being assaulted all at once. Fans blow wind in your face when the scenes merit it, and the theater manufactures its own snow that blows through the air in the mountain scenes. It is a unique experience. Next door is the hall of mirrors. I cheated and used that old trick - if you walk into a maze, just keep your hand on either the right or the left wall and follow it, and it will lead you to the exit. I did use the occasion to take my second ever "selfie." My first one was on the Southurn Rose Carriage in Beaufort. And finally the Haunted Adventure. 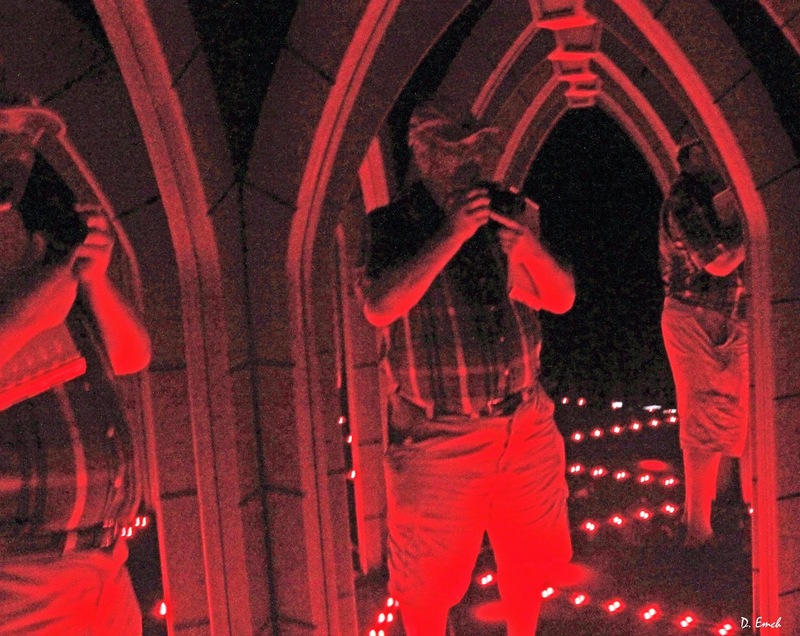 It was too dark inside for any photos to turn out, but it was as good as any haunted house I have been in. I returned at night to get a photo of the outdoor signs, and alas, a few letters were burned out. I am going to have to let Lee and Holden know they need to add a little money to their "Ad" budget. 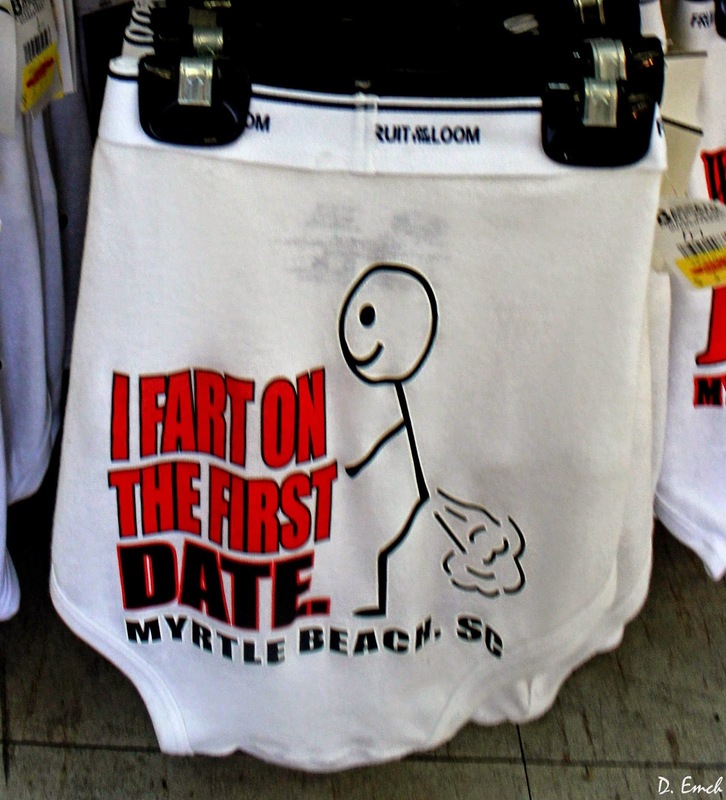 Today's parting shot is courtesy of one of the local beach shops. Usually the most popular theme of each year is on t-shirts. This year it appears it is men's briefs. Have a great Tuesday all! !